Hoobastank broke big with the monster single, “The Reason.” That was in 2004. Since then, the band, led by Doug Robb, has maintained a solid career in an industry that has seen its share of trends. Robb recently stopped by to talk about the band’s new album, “Fight or Flight,” being on the road, and having a widely commercial hit song. Q - The new album, “Fight or Flight,” just came out in September. How was the writing and recording of this album different from past ones? A - This is our fifth album. Albums three and four were written by myself and Dan (Estrin), our guitar player, primarily, without a bass player. I play bass sparingly in the writing process and then in the studio we’d have a session guy come and learn the songs and record some stuff. That would work sometimes and there’s music on those two albums I’m really proud of; but we haven’t written like a four piece band since our second album and there’s a certain amount of evolution and growth that happens in the song when you write it and it’s quote unquote done but then you play it for months and months, in rehearsal and the song evolves and because of Jesse (Charland), our bass player, being a part of it I felt the songs had a chance to mature. I don’t know if it’s a subtle difference that a listener hears but from our perspective it makes a world a difference, especially when you’re playing the songs. Q – The band just played some dates overseas. With the band’s extensive catalog, how much of the new album makes the set list? A – We’d just play a handful here or there because I was of the mind that when I saw bands, when they played new material I’d listen, but kind of check out a little bit. You wanted to hear songs you knew. The rest of the guys were pretty adamant about playing as many new songs as we do. It’s quite a few; I would say about 65-70% of the set are all new songs. I’ve been surprised at how well they’ve done. Even some of our crew guys have said they’re surprised how well the music was being perceived. Q – What types of things do you do on the road now as a husband/father as opposed to being a single guy? I would think the partying has mellowed down a bit? A – (Laughs) My pre-married, pre-child touring lifestyle was pretty mild to begin with. In general, I’m a pretty mellow guy. In fact, the entire band is. All of us will agree that even at the height of our road debauchery we were still tamer than the average dude who goes out and gets fucked up on weed. Honestly, it was pretty mellow. I would like to think that we didn’t play music in the beginning to be rock stars; we just do it because we love playing music. That kind of lifestyle, although it was fun, it’s not the reason we got into this. A – Yeah, yes to both. (Laughs) We released our first record in 2002. It went platinum and had a couple of really successful singles commercially; like things are going well. We already thought we had ‘made it.’ We didn’t even know about success until what happened with ‘The Reason.’ We didn’t even know that existed. Q – The band’s been around long enough to see changes in the music industry, specifically going from CD to digital formats like iTunes. How has this change affected the way you market Hoobastank as a brand? A – We’re kind of a group of musicians that caught the tail end of the old music industry model where people still kind of bought CDs and TV was still playing videos and experienced the old way for a second. I think at that point the record label kind of handled everything; they knew how to market you, how to get you out, there was still radio and video and Internet was kind of a tertiary thing. As long as you got lots of radio play and got a video banging and you had a website up, well, cool, and if not it’s not a big deal. And now the entire thing has been flipped on its head. I think that radio and video now are an afterthought. 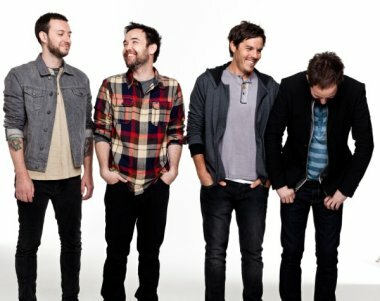 Visit Hoobastank on the web at: http://hoobastank.com/. Jason Tanamor is the Editor of Zoiks! Online. He is also the author of the novels, "Hello Lesbian!" and "Anonymous." Follow him on Twitter at @jasontanamor. Email Jason at jason@zoiksonline.com.